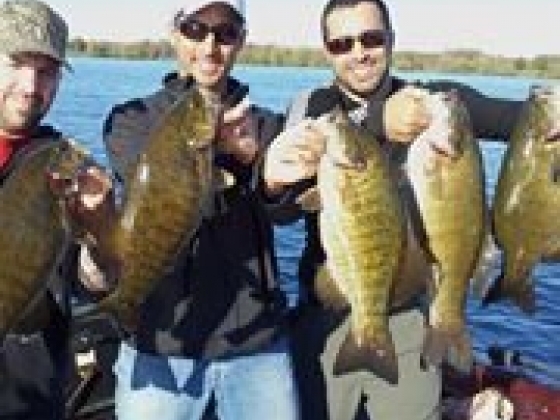 Advanced Bassin' Plus is a highly experienced Tournament Bass Fisherman and Instructional Montreal Fishing Guide, specializing in Smallmouth Bass and Walleye in and around the Montreal region of Quebec. The magnificent scenery can only be lost in the tremendous fisheries this region has to offer. Other fish we go after includes Sturgeon, Salmon, Pike, Muskie. We also have ice fishing trips. 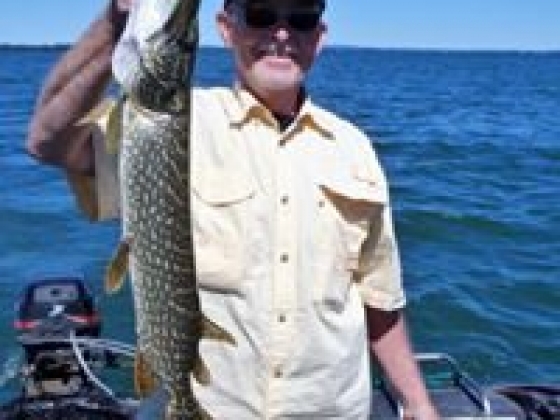 Over fifteen years of knowledge on Montreal area lakes and rivers such as Lake St-Louis, Lake of Two Mountains, Lake St-Francis, Ottawa River, St-Lawrence River, Lake Memphremagog, or Mississiquoi Bay (lake Champlain), will assure fishing memories to last a lifetime. Quebec Fishing Rates Full Day Trips - 8 Hours: $475.00 Half Day Trips - 4 Hours: $375.00 Ice Fishing Adult rates - $125.00 per person Children under 10 fish for free *Rates are for 2 people per trip. $100 more for a 3rd person. These Bass can be caught in deeper water on tubes and jigs, or entering the shallower areas on suspending jerkbaits and slugs. Water temperature will dictate the methods required to entice up to 100 fish days. The Quebec Bass season opens in June. Places like Lake St-Louis, Lake of Two Mountains, Lake St-Francis, Ottawa River, and parts of the Richelieu River as well as Mississiquoi Bay (lake Champlain) and Memphremagog, create unbelievable top water action. Aggressive feeding Smallies up to and exceeding the five-pound mark, with numbers in the three to four pound range are very common. Largemouth Bass fishing also turns on with plenty of good fish taken in the shallows, as well as newly emergent weed lines producing the post spawn lunkers that we all long for. Many a combination day exists with numbers of big fish in both species, making it an experience to remember. Summertime means tougher fishing for most, but not for all. With the high temperatures of July and August we turn to deep-water fishing, where the Smallmouth find their preferred range. We'll concentrate on the steeper edges of shoals and breaklines offshore, where most fishermen seldom venture, dragging Tubes, Spider Grubs, Carolina Rigs and Drop Shot Rigs to entice the less active bass. 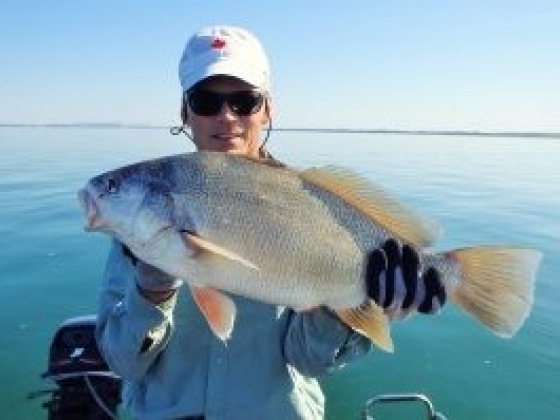 Here we encounter the larger fish, that are not as pressured, continuing to boat plenty of trophy, summertime smallies. September till late November, you'll hammer large numbers of huge fish once again. Starting in Mississiquoi Bay (lake Champlain) in the fall, and then carrying over to the lower St-Lawrence River. Schools of Smallmouth Bass prepare for the winter by feeding on baitfish and crawfish like it's their last meal. Crankbaits or suspending Jerkbaits are the prime choices in the currents of the river. Tubes, grubs, and spider grubs are second to none and even an occasional jigslug, can produce well when the schools are found. Battle trophy Smallmouth Bass from a tournament point of view, or just relax and enjoy what Quebec's phenomenal fishing has to offer. Fish from the comfort of a fully rigged Bass Boat and experience what this magnificent sport is all about. If it's an angling adventure for Bass you're interested in, or just honing your tournament skills to a higher level, Mark Currie's Advanced Bassin' Plus is the one for you. MARK CURRIE has been recognized as one of Quebec's top leading tournament fishermen for many years, accumulating over thirty finishes in the top three and plenty more in the top ten. With a prestigious "Triple Crown", consisting of Angler of the Year, Team of the Year, and the Classic Champion, his credentials speak for themselves. In his prime tournament years, Team of the Year and Angler of the Year awards were accomplished numerous times, also adding to this list. In 2010 he returned to competition once again and added yet another high placing in the "Berkley B1" tournament. After leading the field day one, he ended with an impressive second place finish just shy of another win. Remember, Catch and Release (CPR) is crucial for our future fishing. Take plenty of photos and return those fish so that others may enjoy the pleasures as well. Contact Us and Mention World Wide Fishing Guide for special offers!